Erm… Not sure id get through the interview…. Is Google too cool for Internal memos? Seriously though, I thought this tactic died at the end of the last dot.com boom. The general consensus seemed to be that encouraging workers to spend longer hours in the office works only in the short term. In the long term, productivity suffers as deprivation of external stimuli eventually stifles innovation. First hire us, THEN invite us to play Hockey 🙂 Sounds fun though. I guess we can play as opponents and if that is not possible, we can simply watch the game ;~) what do you say ? I will not relocate my daughter to another city and take a new job just to play roller hockey. I’m running out of chalk here. Hi Matt, I’d like to apply for a position with the hockey team….uh….I mean Google. Matt.. I’m an avid ice and roller hockey player, and I already have the gear. now… how about that job? Sorry, not a Googler, but I couldn’t resist reading. Yes, I will like to be a part of Google just to play the hockey :). I could easily cross the spam protection maths, will that help me get into Google :). Sorry I had to read the whole post as I expected a post on Japanese high-tech commode with a heated seat :). Ha ha ha ha…. Lol@SEOidiot…. I wonder how the Googlers would do in a game against one of the gangs of RollerHockey players who crash the handball courts in NYC parks on weekends and take over the place? They always get thier way, who is going to mess with a bunch of guys in protective gear with sticks and all you have is a small blue ball….. I thought you meant real hockey with real ice….just saying. I would love to work for Google! When will you folks be opening an office in Honolulu? Have you ever seen the requirements to get a job at Google? Not for people who haven’t been to college. Actually, at this year’s SES SJ, a few of us Canadians were looking for a game. Perhaps something to organize for next year? Chris, it’s not even for people who have been to college. It’s for the cream of the crop. I’ve been through the phone interview process, I’ve talked to recruiters. If you want to be looked down upon, that’s the place to do it. The job I applied for made no mention of python in it’s description, but then I was told since I only took a beginner course in python, and am not an expert that I’d stand no chance of passing the next level interview, but if I want to try here’s a worksheet. I sent back the worksheet the next day to no response. Got no response on the 2 followup emails either. Tell us Rayan. Why do you want to work for Google? Matt, when was the last time you went home and spent more than 20 hours at home? Harith, i hate those questions. To tell the truth, I’d rather be asked to estimate how many gas stations are in America than to answer teh ‘why do you want to work here / where do you see yourself in 5 years’ type questions. Maintaining Google’s culture and principles should be the #1 priority if it is not already. A couple guys I work with have played ice hockey against Guy Kawasaki and have said he’s very aggressive. Some of the corporate teams around here have been playing for longer than Google has been in existence and they’re very serious about it. Maybe Google should start off with someone easier, say, the folks at Clusty. Now you’re just teasing us. Google doesn’t want to hire me, and I don’t want to move to the States or Switzerland or Ireland this year. Not even Sydney (nasty busy place…). So, I’ll just stay Down here and not play roller hockey, eh? I thought the RH looked fun when I saw Netscape’s pics of RH way back in the day. The comment on the size was fuuny though ive worked in places (BT) were the main development group have multiple sub groups bigger than that. Rob there leaving early to play sport how is that getting them to spend time inside the googleplex? Ah so this is why Google Ireland turned my job application down, I mentioned that I dont like RollerHockey. I’m from Texas. There is no ice. I’m sure roller hockey is fun, but down here we play flag football. Football Rules! Now a job at Google, I think that would be awesome. Alas, like most people writing here, that would be impossible. The HR department would look at my resume and die laughing. I mean many of us would make great contributions I’m sure. But man, you Googlers are some really freaking smart people. I will go back to reading daily and dreaming of a workplace like that at Google. There’s a lot of ice rinks! But I never see roller hockey there, it’s too darn hott to play outside. At least in Cali you got that nice breeze from the Ocean. you got the tornados (i think that’s what they’re called) up in Frisco… if you ever wanna enjoy minor league hockey that’s the place to do it. I thought about moving to Frisco.. it’s unbelievably cheap to get property there (compared to here in Michigan), and that town is growing like a weed. Too bad I couldn’t find a high paying job there. wow cool jobs, great food and now you play my fav sport twice a week! I wanna join the google squad! I guess work and play can sometimes mix – but only in an industry of trendy dotcoms – if top banks and stock marketers started it we’d have uproar! randomly found this post on roller hockey… can google neighbors play? yes thats true we need to preserve the google culture but the info was really new and strange, i havent search for that keyword i will do it now. Thank the people at google for doing the poppy logo for today on the uk site – maybe they should have linked to this poem (on the RBL site) rfather than to the search results. Add the ice and I’d watch a roller hockey game. I used to work at myCFO (another hot startup funded by Kleiner Perkins and Jim Clark). We were across the street from Google. 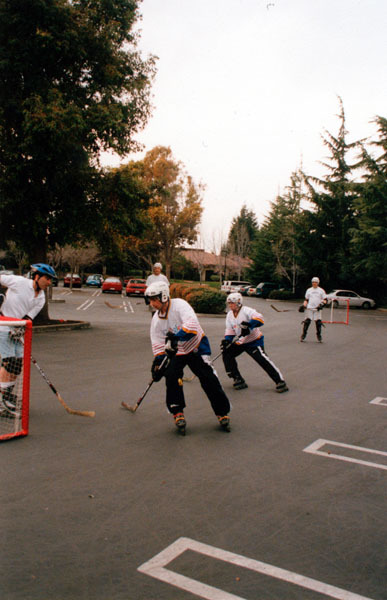 The guys from Google used to play street hockey in the parking lot. We’d always find these broken glasses left over from their games. Folks started collecting them and throwing them in a big jar on my desk — my "art" collection. Now it’s time to return these glasses to their original owners. I play roller hockey AND foosball ! I’m OK at roller hockey, but I’d be glad to come on as the official foosball coach (I even have a couple of Googlers who can vouch for me since I play them in local tournaments every week), so be sure to let me know when that job opens up! I’m the smart-azz that questioned your ‘dual belt’ addition to your halloween outfit a year or so ago, and the guy you referenced in your Danny Sullivan in terview about what I call ‘kicker’ listings. Anotherwords, I search a term and a relevantpage comes up but it also show another page (usually the homepage) just under it. You mentioned Google was to eliminate this from happenening in its results. Any progress on this? As I am still seeing this happening. On a side note, I’ve relocated to England from Atlanta last month. It would great to see you in London in Feb. Are you up for it? What is up with all of the invisible text and keyword stuffing that is coming up in the top 10 results. Look at this sites source code and enjoy the 10,000 words in invisble hidden text. > But what can you do to help preserve Google’s culture? According to the Broken Window theory (well, my take at least), company culture can only be preserved by never committing small evils: every application’s bug that remains unfixed is “inspiration” for more bugs, simply because you created an environment in which — as everyone can see by looking at the single unfixed bug — bugs are seemingly acceptable. This leads to more issues, which lead to even more issues, until — Broken Window theory — the whole neighborhood is deteriorated. I also consider the China censorship move to be such a “bug” in Google’s reasoning, and I think that considering it a “small” compromise is a harmful illusion because compromising on *any* scale creates an environment in which compromises become acceptable. As an example, removing company property from the Googleplex becomes acceptable as soon as you believe in the “little evil for a greater good” theorem formulated by Google management — e.g. you can sell the Google property you stole, and donate 50% to welfare to make it be for a greater good. Now the stealing is sanctioned because the person who you donated this to needs the money more than Google Inc. You will find this problem in a corrupt gov’t, too (talk about China!) — “everyone’s doing it. You won’t get punished for it, because our leaders would first need to punish themselves.” And I’m sure Yahoo’s and Microsoft’s existing censorship activities in China also created the “Broken Window” environment in which *Google* followed — they wouldn’t have done it first. I think you Googlers should organize a Google vs. Yahoo roller hockey game.. Does Google have an ice hockey team for its employees? I think you Googlers should organize a Google vs. Yahoo hockey game..